Every one of us has bad hair days. There are days when you put all your efforts to untangle hair but in vain and end up in tears. 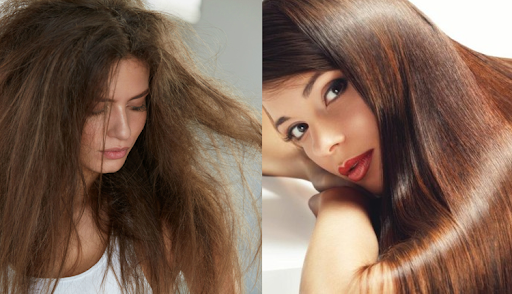 Frizzy hair is hard to tame and manage. And if you have long hairs, maintaining them take loads of energy as well as time. Salons offer hair straightening with chemicals. In the long run, the chemicals damage your hair and lead to hair fall. You may also try hair smoothening or Brazilian blowout which is a less damaging process in comparison to hair straightening. Blow dry is done and hair smoothing cream is applied. After getting hair smoothened in the parlour you are required not to tie, pin or tuck your hair for at least three days. Also, you are not allowed to get your hair wet. After three days you will be given hair wash in the salon after which you can wash hair at home in 2-3 days with the suggested hair product according to your hair type. It is advised not to oil your hair for at least 15 days. Hair smoothening at parlour may cause dizziness, skin rashes and teary eyes. There may be a burning sensation in eyes and itching in the larynx. The chemicals used may cause nausea and dizziness. Also, the quality of the hair and scalp is affected. Damage is caused to the natural texture of hair. Your hair and scalp may become dry, there are split ends, hair greasiness, hair discolouration and hair thinning. The only solution is hair smoothening at home with natural ingredients that will nourish hair will give you soft, strong and healthy hair. Sharing below a few amazing DIY hair smoothening masks. Peel the brown skin of coconut and blend to make a paste. With the help of a muslin cloth extract the milk of coconut. To a bowl add coconut milk, lemon juice, cornflour and water. Cook this paste until it becomes thick in consistency. Let the mixture cool and then add castor oil. Now, this is a homemade DIY hair smoothening recipe that can be stored in your refrigerator for months. Comb your hair ensuring that there are no tangles. Taking small sections at a time, apply the mixture all over your hair and scalp. Do not leave any hair strand untouched. Rinse your hair and shampoo. Massage your scalp and apply the oil all over your scalp and hair. Leave it for overnight or half an hour. *If you have oily scalp avoid applying the oil to roots and leave the oil only for 20-30 minutes. Apply the paste to your hair from root to tip. Rinse with water and shampoo as usual. Mix the ingredients and rinse your hair with diluted ACV solution after shampoo. Use this as a final rinse. After using any of the above DIY hair smoothening mask you can feel the difference. Natural ingredients nourish the scalp and make your hair healthy, soft and smooth. Be regular with the application of whatever hair mask you choose for yourself.